If you’re afraid of change — either the fear of changing or being afraid not to change — today’s episode will equip and empower you for change…GROWTH. There’s nothing greater than growth. Does it always feel or look great? Nope. Absolutely not. But as long as we’re growing, we’re living fully. What is it that YOU desire…to change? 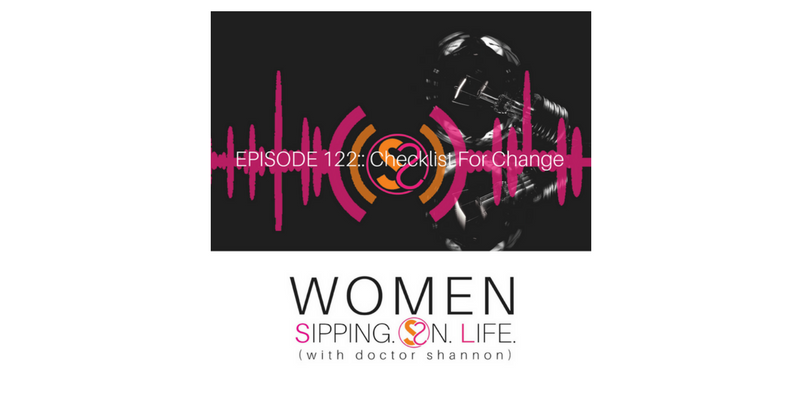 Once you’ve done the EDIT For Change (EPISODE 121)…now you can see and hear clearly. Last week I did a LIVEINAR on Getting Clear Before The New Year where I did a full training on getting clear about desires, and creating change using the CHECKLIST FOR CHANGE. However, whenever you’re listening to this podcast, THE DAY to get crystal clear is TODAY. Start today. Look at what you desire and then commit to creating it. I’ve created a CHECKLIST FOR CHANGE to help you do that. You can download it here. It’s a proven, effective strategy for maximizing your growth, getting crystal clear about your desire, as well as how to create it. It’ll provide a framework that’ll help you lay it out for yourself. Picture a hashtag or old-school tic-tac-toe. These 9 areas of focus can CHANGE everything! It’s about getting back to the basics! WHY? The answer is “change.” Yes, I believe you desire CHANGE. Hope? What’s your HOPE (belief, desire, trust) for change? Commitment? What’s the COMMITMENT you’re making today? Are you committed to CREATING CHANGE? Engage? Where are your putting your energy, attention, and time? Aware? Are you AWARE of what it’s going to take to create your change? Ask the necessary questions so you KNOW exactly what’s required. Date? What’s your DATE for change? Now and in the future. Love? Are you willing to direct the powerful creative force of LOVE towards creating the life and life’s work that you LOVE? Actions? What two ACTIONS are you taking right NOW, as well as NEXT?